The purchase price you pay on an eligible new or used Harley-Davidson Street® or Sportster® model is the money you get back when you trade in* before August 31, 2020. See a Harley-Davidson® Dealer for details. 1. The customer (“Purchaser”) must purchase a new or used model year 2013 or newer Harley-Davidson Sportster motorcycle available and in stock a participating U.S. H-D dealer ("Eligible Motorcycle") between February 1, 2019 and August 31, 2019 ("Sales Period"). 2. Purchaser who purchases an Eligible Motorcycle during the Sales Period has the option to trade-in the Eligible Motorcycle at its original purchase price towards the purchase of a new, unregistered, model year 2017, 2018, 2019 or 2020 Harley-Davidson Touring, Trike, Softail, Dyna, Sportster, Street or Special. 3. Edition/Shrine Big Twin motorcycle (“Eligible Trade-Up Motorcycle”). Offer is limited to one claim per eligible VIN. Excludes Police Models. The trade-in must occur no later than August 31, 2020 (“Trade-Up Period”). 4. Customers must redeem the offer at the same H-D dealership where the Eligible Motorcycle purchase originated. Certain exceptions apply for customers who move during the Trade-Up period. See participating H-D dealer for details. 5. The owner must have the original bill of sale and title in the original owner’s name as valid proof of purchase of the qualifying new motorcycle at time of trade-in to qualify for this offer. 6. Original purchase price does not include taxes, title, registration, license fees, state fees, parts and accessories, dealer set-up/prep/freight charges, ancillary products (e.g., Extended Service Plans, GAP, wheel and tire coverage, etc…) and other dealer add-ons, regardless of the amount actually paid. 7. The offer only applies to Eligible Motorcycles submitted for trade-in on a new, unregistered Eligible Trade-Up Motorcycle of greater value and not the same model. Offer is limited to one claim per eligible VIN. Offer is limited to one claim per customer. 8. The Purchaser is responsible for the difference between the trade-in value of the Eligible Motorcycle and the purchase price of the Eligible Trade-Up Motorcycle. 9. Trade-in must be a vehicle in good condition and good working order. Tires, suspension, engine, and transmission must all be within factory specifications and are subject to inspection by the participating H-D dealer. Vehicle exterior cannot reflect neglect or abuse. The participating H-D dealer will make the sole determination regarding whether the trade-in is in good working condition and good working order. 10. The purchaser is responsible for all costs of operating and maintaining the Eligible Motorcycle prior to trade-in. 11. This offer may not be combined with any other promotions, offers or discounts without the express permission of Harley-Davidson. 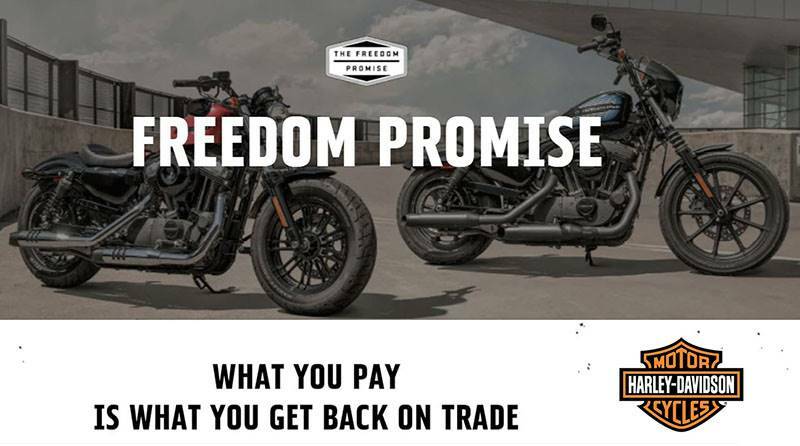 However, qualified customers can use Harley-Davidson Financial Services special financing promotions in conjunction with the Freedom Promise. The Freedom Promise trade-in benefit will not be considered as part of the rider’s down payment. 12. This offer is not transferable except to the original owner’s spouse or to the original owner’s legally recognized domestic partner, provided such person lives in the same household and has the same permanent address as the original owner. The H-D dealer may require documentation to substantiate this relationship before extending the offer to the spouse or domestic partner. 13. Eligible Trade-Up Motorcycles must be taken from dealer stock and are not available on future motorcycle orders, deliveries or deposits outside the Trade-Up Period. Certain models of motorcycles may not be available at some participating dealers. 14. Valid only at participating U.S. H-D dealerships. Offer not valid in Hawaii. Non-transferrable. Cannot be redeemed for cash or cash equivalent. Offer not valid on motorcycles purchased and/or delivered outside the Sales Period or outside the U.S. Harley-Davidson and/or H-D dealer are not responsible for lost or stolen proof of purchase documentation. Offer is subject to change without notice. Void where prohibited.